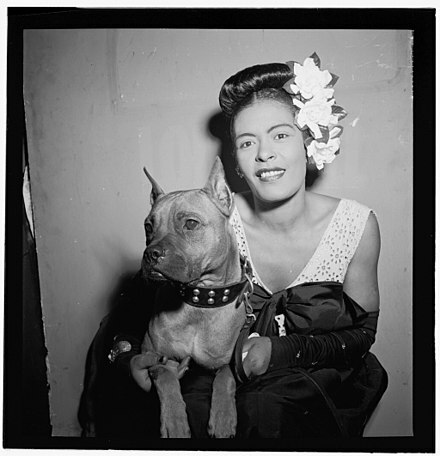 "When Dufty asked her if she had ever read anything written about her that was accurate, she recalled 'The Hard Life of Billie Holiday' -- an article based on an interview she had done with journalist Frank Harriott for PM newspaper in 1945. Dufty discovered that the material in it was rich enough to be the basis for the first three chapters of the book, often using what had been written verbatim or changing it slightly to standardize the narrative. When she read what she had said ten years before, it set Billie to recalling things long forgotten. Dufty went on to find other interviews she had done for PM, Metronome, Down Beat, and elsewhere that he could draw on. "Billie turned her eyes to us, smiled, and her frown disappeared. She lighted a Chesterfield, and began speaking rapidly, between short, reflective pauses. "Miss Holiday's explosiveness ... is no simple formula. In 23 superbly chosen words, she has established her background, recorded at least five relevant facts, illustrated (by her method of doing so) one facet of her own character and made firm friends with the reader by a breathtaking and slightly naughty denouement. Too many of her imitators felt that vulgarity or sheer improbability were satisfactory substitutes for the artfully conjured impudence and shock which characterized the original."